Rubber has become very prominent in industries as far as its production is concerned. It is used all around the globe in many things, most importantly the tires of vehicles. 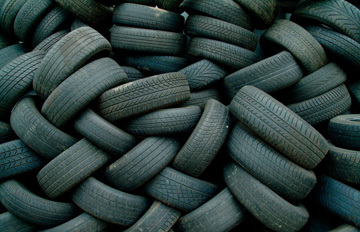 It is necessary to recycle rubber as it increases landfill pollution. The rubber takes a very long time to decompose and when it is burnt, poisonous and carcinogenic gases are released increasing the pollution. When the rubber collects rain water it acts as the breeding space for mosquitoes and insects. So rubber is recycled in industries to assist the economy and it also saves energy. The first step is to collect the tire material from the landfill and then take it to the production side that is an industry. There should be a proper system of disposal and people should make sure that their rubber tires get recycled. In devulcanization the tire mulch is made from the rubber of the old tires, so that new tires can be made. The mulch is made in granular substances and steel or other strengthening substances are removed from it but rubber does not lose its elasticity and insulation property. Heating, softening and chemical agents are to be applied to keep these properties. The tires are hedged mechanically. The shredding process takes place in vigorous and robust machines. Pulverizing machines use rotors in further shredding into rubber strips and remove steel fibers from it. Powerful magnets are required to separate steel and other magnetic elements. At last the Granulators remove remaining elements from rubber and convert them into different sized granules which are later used for different processes. This process gives flexible and spring like characteristics to the rubber mulch. Rubber polymers are strengthened by adding steel and sulphur which make bonds between them stronger and it is later used in making tires and other materials from it. Freezing Method: It is a less common process. In this process the rubber is frozen with the help of liquid nitrogen. It is then processed in mills and grounded in the similar method already mentioned above. Pyrolysis: It is the process of melting rubber in the absence of oxygen so that combustion does not take place and toxic fumes are not produced. It is decomposed into char, oil and gases during this process. Although it is realistic but still research is going on to make it happen on a bigger scale. Used as cushioning in parks, schools etc. so that if children fall, they are not hurt much. Used in sport shoes, working shoes and raincoats in clothing industries. Rubber along with other strengthening material is used in making sidewalk panels which are more resistant to be damaged by roots and also serve as a more comfortable pavement. Use in landfills as a protective covering. Serve as a coal fuel source. So, because of all the uses of reclaimed rubber it is best to get rubber recycled. Instead of letting rubber rot in landfills they should be used in rightful ways. Not only it would assist economy but also would save the earth from pollution.